Everyone (except Tim and Jason who had to work) went to California Adventure on Friday (Jan. 18, 2013). The weather was hot…sunny with temperatures reaching the low 80s. They got to the park early and did a number of rides including California Screamin’ (roller coaster), Mickey’s Fun Wheel (ferris wheel with swinging gondolas), Goofy’s Sky School (a different type of roller coaster), Hollywood Tower of Terror (a few did this one), and Toy Story’s Midway Mania (3-D shooting game). Jeri took Josiah to Disneyland. Josiah loves the Peter Pan story and likes the ride, Peter Pan’s Flight. 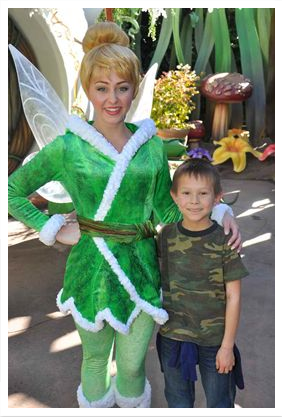 He got a chance to meet Tinker Bell as well. They finished their time with the new Radiator Springs Racer in California Adventure before heading home (via Taco Bell) around 2 PM. Tim (who took vacation on Tuesday and Wednesday), Jeri, Victoria, Jeffrey, Elizabeth, and Josiah all went to California Adventure on Wednesday this week. After a few weeks of cool weather (highs never getting out of the 60s), we had a really nice day. It was sunny and around 75 F.